Astronaut Ron Garan has spent 178 days in space, traveling 71,075,867 miles in 2,842 orbits of our planet. During his time in space, looking down at the planet Earth below, Garan's perspective of this world we live in evolved. In his experience with the space program and his time on the International Space Station, he saw the way that nations were able to put their differences aside, joining together to build the most complex structure ever built in space. Yet, oftentimes, our differences are what make it impossible to work together in this way here on Earth. So much could be accomplished if nations and people could look to the common good, rather than their own gain. 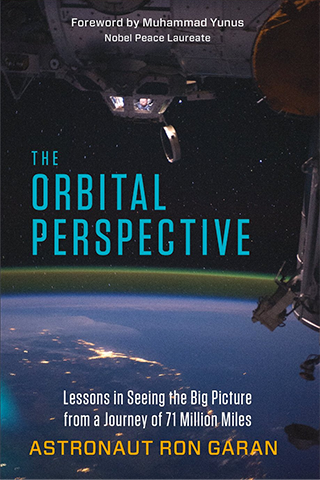 The Orbital Perspective: Lessons in Seeing the Big Picture from a Journey of 71 Million Miles is Ron Garan's call to action. He shares stories of his own, of the space program and of humanitarians around the world who are making connections and collaborating together to address challenges on Earth. He shows how governments, organizations and individuals can come together, overcome their differences and have a positive impact on our world. As far as the book itself goes, I found that I enjoyed some chapters more than others. The history of the space program and the collaboration between Russia and the U.S. was interesting, as were the stories of Garan's experiences in space. Some chapters were a bit more dry, and I found the use of the phrase "orbital perspective" to be quite repetitive after a while. But Garan's message is clear and important, and I hope that it will take flight around the world. This review was written based on a copy of The Orbital Perspective that I received from FSB Associates in exchange for an honest review. This post includes Amazon Affiliate links. If you use one of these links to make a purchase, I will receive a very small commission but your price will not change. I felt the same way while reading this book. It's amazing how nations were able to work together so easily when we were dealing with space, a place with no borders. It would be amazing if we could all find that way to collaborate here on Earth.